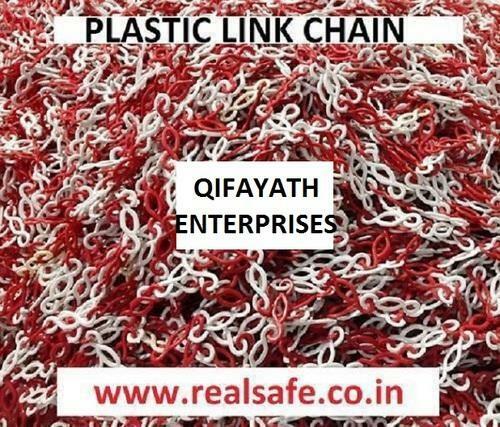 We are offering a wide range of Plastic Link Chain that is available in various sizes, design and colors. Manufactured using quality material, these road safety equipment and appliances are appreciated for their reliability and durability. Further, to meet the varied requirements of our clients, we also provide customization facility. We are the one of prominent manufacturer, exporter and supplier of Fire Extinguishers ISI Mark - Portable, Trolley, Automatic & Flooding Systems, Fire Alarm System - Smoke Detectors, Heat Detectors, Flame Detectors, Beam Detectors & Gas Detectors, Fire Hydrant System, Sprinkler System, Fire Hydrant Hose & Hose Reel and Personal Protective Equipment - from head to toe. Apart from these, we are also offering Security Equipment - CCTV Surveillance Systems, Metal Detector, Search Lights, First Aid Box, Emergency Equipments, Personal Protective Equipments, Traffic and Road Safety Equipments and Glow in Dark Signages and General Signages. These are manufactured utilizing high grade raw material sourced from reputed vendors. Further, these are also available with customized options to meet the varied requirements of diverse industries as well as commercial and residential sectors. We are bestowed with a well-developed manufacturing unit along with an in-house designing unit that enable us to meet the specific as well as bulk requirements of our clients within stipulated time frame. Besides manufacturing, we are also offering continuum of services for conducting fire drill and rescue training program at factory premises with certificates at nominal charges. Some of the renowned names that we are serving are Tamil Nadu Electricity Board, Kerala Electricity Board and State Bank of India. We are bestowed with a well-developed manufacturing unit along with an in-house designing unit that enable us to meet the specific as well as bulk requirements of our clients within stipulated time frame. Besides manufacturing, we are also offering continuum of services for conducting fire drill and rescue training program at factory premises with certificates at nominal charges. Some of the renowned names that we are serving are Tamil Nadu Electricity Board, Kerala Electricity Board and State Bank of India Etc..